last year i took molly to portrait innovations for a quick and impromptu photo shoot the day before her surgery and they turned out so cute i wanted to follow up this year as well so i would have similar photos to compare. so this morning she woke up in a good mood and it was a rainy/cloudy day so i thought it would be a perfect day for photos. i got her clothes ready, called for a last minute appointment, packed snacks, and off we went for a 9:40 appointment. by 10:00 we were back in the the car leaving the studio. what happened? a complete refusal to follow directions and cooperate on Ms. Molly's part! ha! but, i guess you can see from these posts who won in the end, right? that's right, this mom was not down for the count just yet. i put her in the car, gave her a stern talking to, showed her my handy "car paddle", aka wooden spoon, and let her know that i was not opposed to using it, even if she did look so darn cute in her outfit! i called another portrait innovations about 30 minutes away for an appointment and off we went with me lecturing her the entire trip. by 11:00 we were at our second appointment and she was doing great. what was the different? (besides the lecture and threat of a spaking? ), i think it was the fact that at the first place a guy was the photographer and didn't try to interact with her at all to get her comfortable and to loosen up. although, it was not his fault entirely she was totally not cooperating. 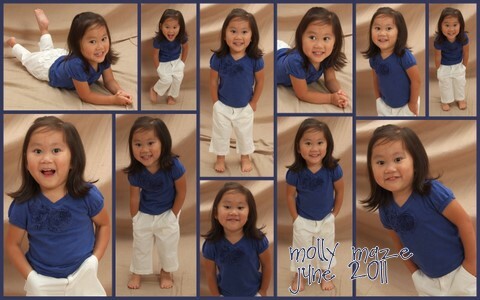 then, at the second place the photographer was a mom of young children so she knew exactly what to do and say to get molly to cooperate. lesson learned...the photographer makes all the difference! even though these "staged" type of photos aren't my fave, they are a quick way to capture the look and age of your child. and i love these photos. i think we came out with no less than 1,318 pictures. so if you want a picture of molly, just leave your address in the comments and i'll be glad to send one! ha! there are several more outfits/poses so you'll be seeing more this week. Oh how I feel your pain! Glad you got pictures in spite of the frustration! Can't believe how much she's changed. It's so wonderful and so sad how quickly they grow! The pictures are beautiful! The only professional photo we have of Haleigh is from our older daughter, Natalie's, wedding in November. The photographer took almost as many pictures of Haleigh as he did the wedding! LOL! We just haven't tried, because she doesn't even cooperate for pictures for us! Your "wooden spoon" made me laugh. I carry a spatula in my purse for the same reason! Usually just "seeing it" can change a behavior!